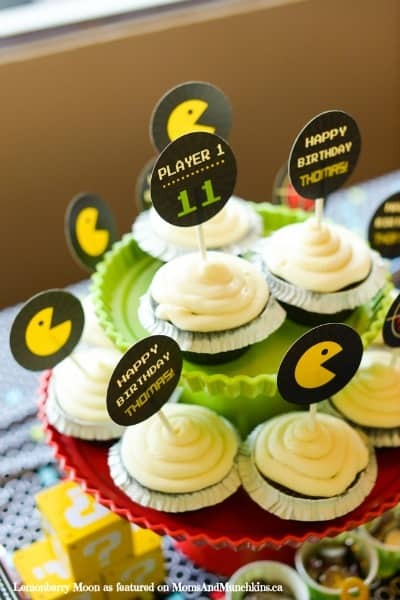 Arcade Birthday Party - Making Yours Stand Out! 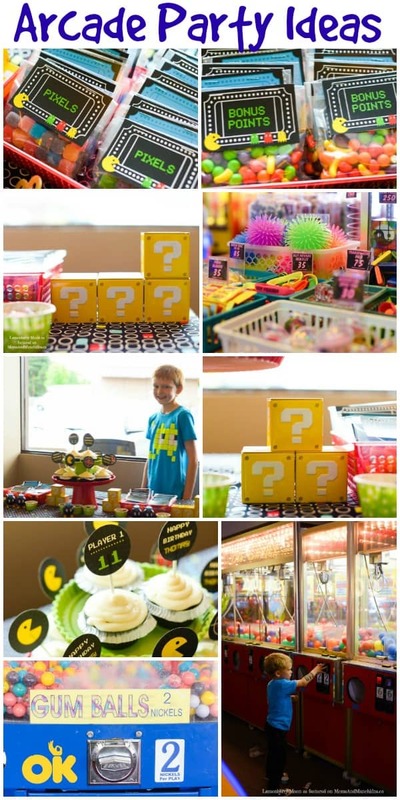 This Arcade Birthday Party post is courtesy of our contributor Elizabeth…Being a party planner I have enjoyed designing themed parties for my boys. My oldest is getting to the age now where he wants “normal” parties. You know, go to the arcade, jungle gym or Trampoline Park with some friends, eat pizza and be done. No perfectly decorated treats or themed activities, just a regular ol’ party. With a few small tricks we were both happy! 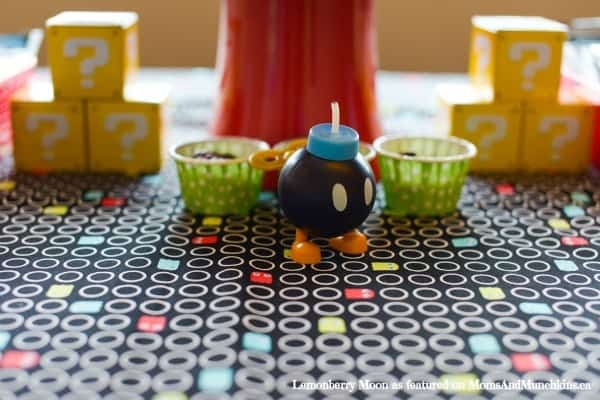 Bring a Themed Tablecloth – For this Arcade theme I found a Pac-Man themed fabric. Just a couple yards make a great table covering, no sewing needed! 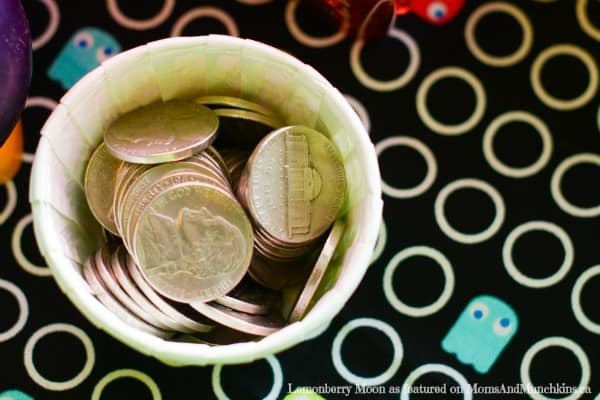 Use Fun Containers For Your Coins – This will help the kids keep track of their coins and add a little pizzaz for the party planner in you. Bend The Rules – Most of these places won’t let you bring in outside food other than cake or cupcakes. Be sure to check with the management on the specifics of this rule. Some will allow you to bring in treats as long as they are sealed and not opened until the kids get home. 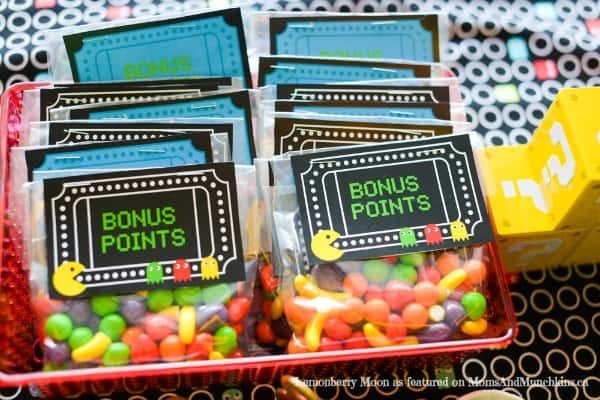 Seal your themed treats in cellophane bags and display them on your party table. 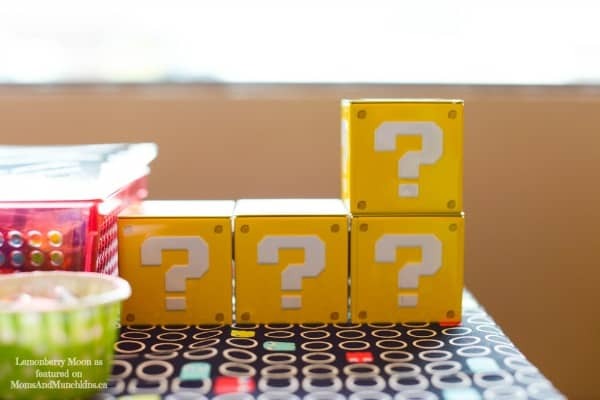 Use Printable Party Labels – Printable labels lend a hand to any theme. Add cupcake toppers to plain store bought cupcakes; use buffet labels for your sealed treats and bottle labels for sealed bottles of water. 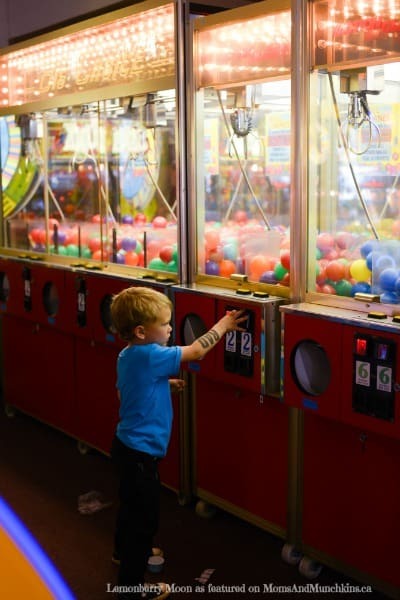 Get Creative With Your Favors – Most arcades will give tickets so kids can choose their own toys at the counter, but I always like to add a little something special. 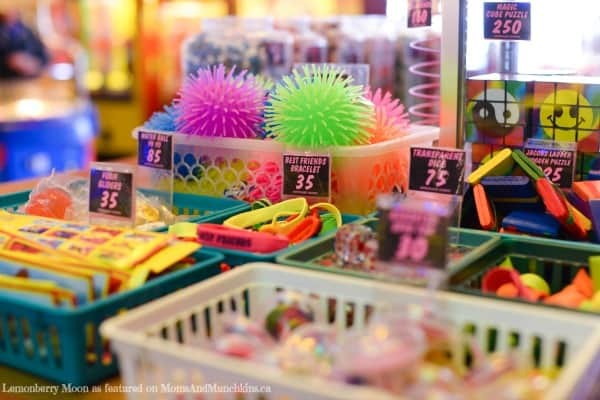 Give each child a pair of funky fun socks for a bounce house or trampoline party, glow sticks or glow in the dark tattoos for a laser tag party or video game character candies for an arcade party. Regular ol’ parties aren’t so bad after all. You can still get creative and you may even have time to sit and enjoy the party! 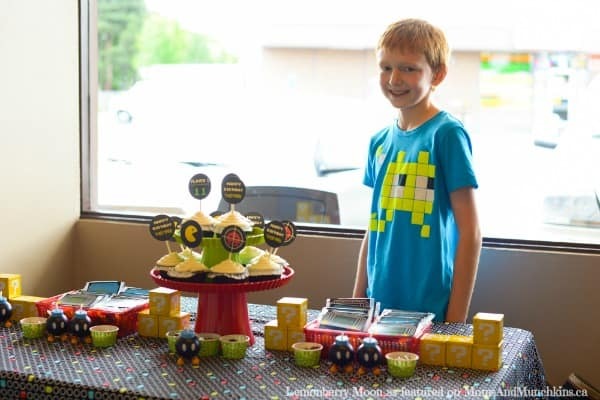 Thank you to Elizabeth for sharing these creative party ideas with us. You can read more about her son’s Arcade Party here. For even more creative ideas, be sure to follow her on Facebook & Pinterest. 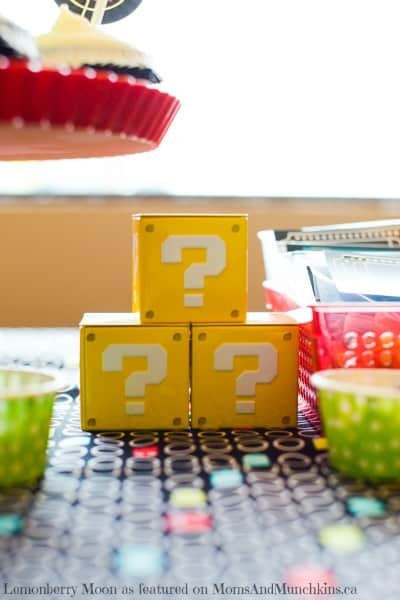 You must check out her Etsy shop filled with creative ebooks on party planning a variety of creative birthday themes. I love these books filled with party ideas, printables, recipes and more! 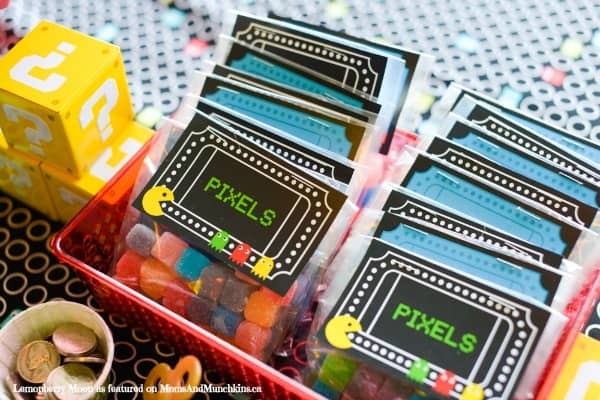 For even more fun Arcade party ideas, visit our special Arcade category. 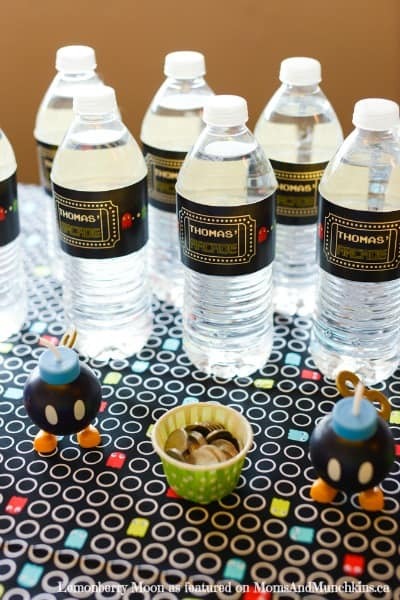 Adorable party! Love the bright colors. I’m sure it was a huge hit. I’d be thrilled if you’d link up at this week’s Off the Hook! and Keep an eye on the kids or better yet two and maybe a hand! We took the grandkids to an arcade to give Mom and dad a date night. 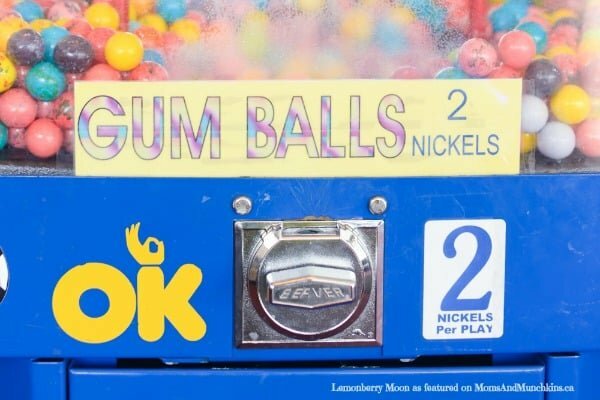 A couple hours in at one of the games, I look away for a second, turned back and saw the grandson needed another token for his game, dropped it in and realized it was not my grandson! the little guy stepped off and the new boy stepped up in a blink! It was scary then but funny later lol. Oh my gosh, little kids are SO quick, aren’t they? !